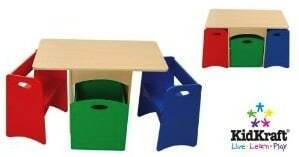 This cute and functional KidKraft Table with primary benches is priced at $99.99. That's 42% off the list price of $171! I absolutely love that this table has a built in space for the included storage bin. The bin is even on wheels for easy access! The same set is also available in white with pastel benches and storage, but you'll pay $18 more for it.